We've been here for 3 years, "Lovin It"
We want you to come and visit Quilting Divas, but until you do, here is a virtual tour. We hope to see you soon. My family wanted to make sure you were always greeted properly. This Diva will be sure to say "HI" as you enter the shop. The Witches are in the Shop!!!! The fabric for the children in our lives is sure to catch your eye. You'll find flannels, brights, fun prints, Cuddle fabric and Double Gauze. Judy does beautiful work on her Long Arm, customers wait 3 months. We have a wide variety of fabric for any quilting project. And if you need to use the restroom, you'll find a special quilt just for you! This "Angel of Hope" is meant to watch over all families and friends sharing the light of hope and courage. 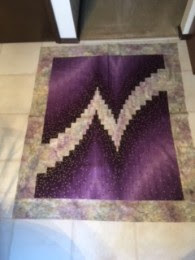 Two Fabric Bargello, select an Ombre fabric and a coordinate for this beautiful Bargello. This quilt was made for my sister Sandy, everyone at the April Quilter's Pantry Retreat made a block and it was put together and presented to her at the October retreat. Sandy is a breast cancer survivor. Each month this wall recognizes a quilter in the community. We display about 10-12 of their items and get new ideas and wonderful color/fabric designs. Barb Tryon is the proud owner of these beautiful quilts. Caught in the act, wrapped up in Gail Muller's beautiful Sylvia's Bridal Sampler quilt and sleeping on the job. Check out the Wabi-Sabi Quilt Art Challange on display in July at Quilting Divas. This challenge was between 3 artsy groups from Silver Thimble, Keep me in Stitches and Quilting Divas. 22 quilters participated in the challenge and created very interesting and unique pieces. Hopefully you will see this display in the future at some quilt shows. We all love the Quilted Village, stop by to check it out. This was a BOM from 2012, hope this inspires everyone to complete theirs. 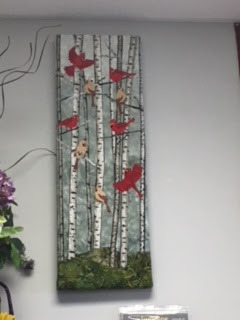 Cardinal in the Birches, we have mounted this wall hanging on canvas board and it great! !